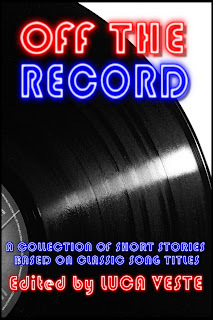 The big news down Brit Grit Alley this week is that Luca Veste's charity anthology Off The Record 2 is OPEN FOR SUBMISSIONS. 'So, in the last post, the announcement about Off The Record 2 was made. Whereas Off The Record 1 contained stories based on song titles, this time we're going with film titles. One thing I didn't do last time, was open up the anthology for submissions. Everyone involved was asked personally to be a part of it. Well, this time we are. I'm going to supply three film titles, some guidelines, and a deadline. This is a chance to not only be a part of a great charity anthology, raising money for two very important charities, but also be published with some of the top names in the writing world. We're looking for short stories between 750 and 2500 words, with as strong a tie to the film the title of the story is inspired by as you feel. Any genre. Seriously, any genre at all. I'll read anything and make a decision on the story contents, not its genre. No quotes from the films, or characters of the same name from that film (due to copyright reasons), but the story needs to have some relation to its title. Here's the deal. Pick any one of those titles, write the story, and send it to guiltyconsciencesubmissions@gmail.com by 1st September 2012. Open to anyone, anywhere in the world. Any questions, please email. Only the best stories will be chosen. Which means if we receive three stories for 'Ghost' for example, but they aren't of a good enough standard, none will be chosen. Stories must use these titles. Please don't spend time writing a story with a different title, and hope to get involved. A lot of titles have already been taken. We're hoping to find some great stories, from some perhaps lesser known writers (but if you're reading this Stephen King/Dennis Lehane/James Ellroy I'll have a look at your stories as well), and give them the opportunity to have their story be a part of something very special. You're not getting paid, but are helping to raise money for charity. What could be better? Apart from getting paid of course. And for a limited time, I've lowered the price dramatically of Off The Record 1 to just 77p in the UK, 99c in the US, and 86c in Europe. All proceeds go to two children's literacy charities.